Korea Chair experts helped to explain, assesses and interpret the results of the Singapore Summit on June 12 , 2018 and the road ahead. 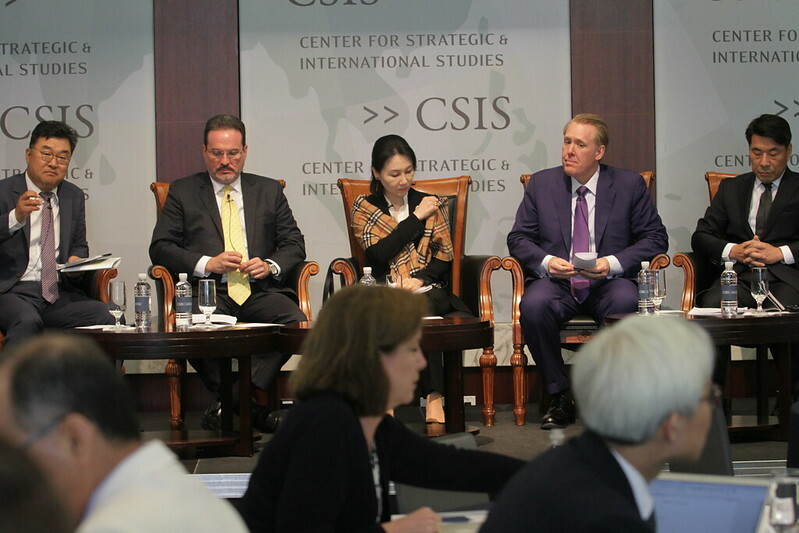 CSIS experts were interviewed on national media outlets for their assessment of the Singapore Summit, including NBC, MSNBC, Fox News, CNBC, CNN and more. Trump and Kim Have Just Walked Us Back From the Brink of War by Victor Cha, The New York Times, June 12, 2018. The Trump-Kim summit is marked by more angst than optimism by Sue Mi Terry and Bruce Klingner, Los Angeles Times, June 11, 2018. The Trump-Kim Summit: Outcomes and Oversight, testimony by Dr. Michael J. Green before the House Committee on Foreign Affairs Subcommittee on Asia and the Pacific, June 20, 2018. Next Steps on U.S. Policy Toward North Korea, testimony by Dr. Victor Cha before the Senate Committee on Foreign Relations Subcommittee on East Asia, the Pacific, and International Cybersecurity Policy, June 5, 2018. Assessment of the Singapore Summit by Victor Cha and Sue Mi Terry, CSIS Critical Questions, June 12, 2018. North Korean Human Rights and the Singapore Summit – A Goal or a Tool? by Ambassador Robert. R. King, Korea Chair Platform, June 5, 2018. The Impossible State. Each week join the people who know the most about North Korea—The Center for Strategic and International Studies’ Victor Cha, Mike Green, and Sue Mi Terry—for an insiders discussion with host H. Andrew Schwartz about the United States’ top national security priority. Stunning Our Allies, Episode 4 of The Impossible State podcast. Dr. Victor Cha and Dr. Michael Green talked about the outcome of the Singapore Summit. Post-Summit Press Conference Call with Michael Green, Victor Cha, Sue Mi Terry, and Bonnie Glaser, June 12, 2018. On June 18, CSIS Office of the Korea Chair and the Korea Foundation co-hosted the third annual ROK-U.S. Strategic Forum at CSIS headquarters in Washington, D.C., a timely discussion with scholars, experts, opinion leaders, and government officials from the United States and South Korea who will participate in a series of panel discussions focused on the historic inter-Korean and U.S.-North Korean summit meetings, the potential for denuclearization and building a peace regime on the Korean peninsula, and regional implications of summit diplomacy for Northeast Asia.